The third Star Wars Battlefront—just called Star Wars Battlefront—will be out on November 17 for PC, Xbox One, and PS4. It’ll take place during the original film trilogy and let people play as iconic characters like Boba Fett and Darth Vader, according to an AP report. It’ll also let you go to a planet from The Force Awakens—before that new movie is even out. 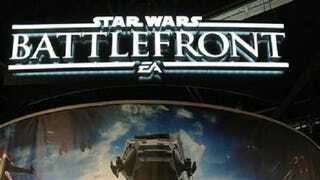 The AP appears to have broken an embargo on Battlefront, which press (including a Kotaku freelancer) saw yesterday during the Star Wars Celebration in Anaheim, California. Publisher EA has touted plans to reveal a new trailer—our first real look at the upcoming Star Wars game—at 1:30pm ET today, but for now, we’ve got details on the game thanks to this report.